Located at the foot of Monte Pellegrino, overlooking the Gulf of Palermo, the Grand Hotel Villa Igiea is a splendid luxury hotel situated in the district of Acquasanta, in Palermo. The historic city center is reachable by public transport or taxi, and is about 3 km away. Palermo airport distance approx. 30 km. The refinement of the Art Nouveau style, the original furniture and the romantic atmosphere of the Belle Epoque characterize the Grand Hotel Villa Igiea MGallery by Sofitel, which for over a century, welcomes guests looking for a pleasant stay in Palermo. It surrounds himself with colorful terraced gardens, the scent of jasmine and Mediterranean herbs. 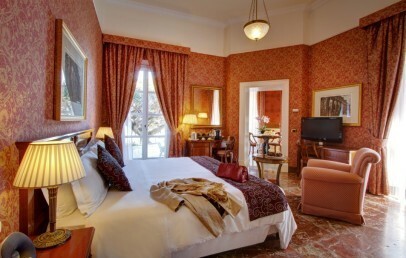 The offer of the Grand Hotel Villa Igiea is among luxurious rooms and suites, depending on your needs. All rooms feature the following amenities: complimentary Wi-Fi internet connection, marble bathrooms with complimentary toiletries, TV Sat, hair dryer, minibar, air conditioning. Rooms for guests with limited mobility are also available. The rooms can have a king size bed or twin beds. In the main building the rooms are furnished in Art Nouveau style, while the ones situated in the Yacht Club (above the Marina of Villa Igiea) are furnished in a contemporary/modern style. Modern sports facilities are available in the gym. Those who prefer outdoor sports can instead go to the hotel's tennis court. Children are very welcome and until 4 years they are hosted free of charge. Upon request the hotel provides high chairs, cots and a convenient babysitting service. Breakfast, lunch and dinner are served in the elegant atmosphere of the Donna Franca Florio Restaurant: on hot sunny days, you can sit in the beautiful panoramic terrace, which offers an exciting view of the sea. Every day, from 10.00 to 24.00, the Bar des Arcades offers snacks and light lunches. Here, guests can relax in the sofas and have a drink or a cocktail, delighted by the background music of the piano. The beautiful hotel pool overlook the Gulf of Palermo: the ideal atmosphere to relax, immerse yourself in the perfumes of the garden and the charming view of the sea. A parking is available to guests, free of charge. The Wi-Fi connection is available throughout the hotel. Pets are accepted with a surcharge. 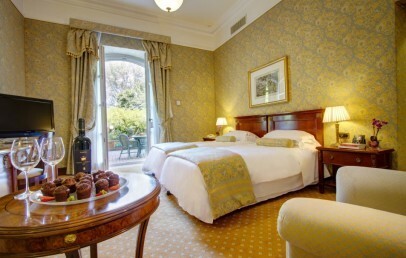 Rooms furnished in an elegant Art Nouveau style, located in the main building or in theYacht Club (the ones in the Yacht Club are decorated in contemporary style). The marble bathroom has the bathtub (some have the shower, too), hairdryer, complimentary toiletries, bathrobe and slippers. Wireless Internet connection available with an extra cost. 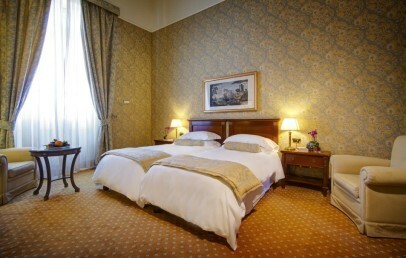 Spacious rooms furnished in an elegant "Art Nouveau" style and located in the main building. The marble bathroom has the bathtub and some have also a shower, hairdryer, bathrobes, slippers and complimentary toiletries. 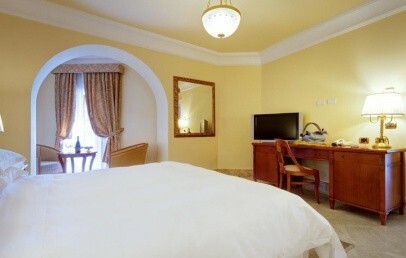 The Premium Deluxe rooms have a wonderful private balcony overlooking the pool, the nice garden and the gulf of Palermo. The Wi-Fi internet connection is available with an extra cost. A additional bed is possible on request. 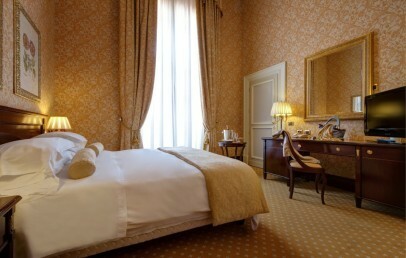 Exclusive and spacious Junior Suite furnished in an elegant “Art Nouveau” style. They have a comfortable living room with sofa and desk. The marble bathroom has the bathtub and/or shower, hairdryer, complimentary toiletries, bathrobes and slippers. The Junior Suite have wide windows offering a wonderful view over the sea or the garden. The Wi-Fi internet connection is available with a surcharge. Some special services are provided for Junior Suite’s guests, such as a pillow menu and a bottle of wine at arrival. The Junior Suite can accommodate up to 4 people. 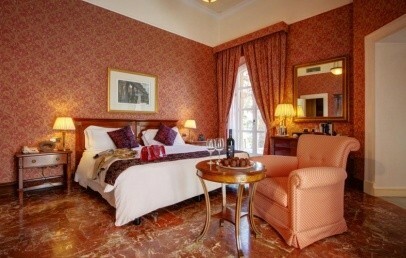 Large and exclusive Suite with two separate rooms and furnished in an elegant “Art Nouveau” style. There is a comfortable separate living room with sofa and desk. The spacious marble bathroom has the bathtub and/or shower, hairdryer, complimentary toiletries, bathrobes and slippers. The Suite has a window offering a wonderful view over the sea. The Wi-Fi internet connection is available with a surcharge. Some special services are provided for Suite’s guests, such as a pillow menu and a bottle of wine at arrival. The Suite can accommodate up to 4 people. 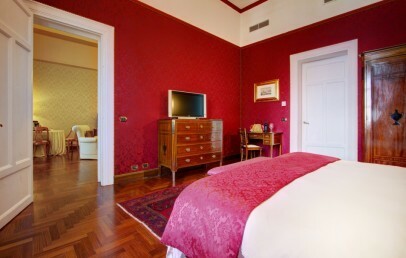 The Classic rooms have all view on an internal part of the hotel and are furnished in “Art Nouveau” style, with drapes and flocked wallpaper in warm colors (or the Deluxe located in the Yachting House only a short walk from the main building, are furnished in a modern Mediterranean style). They are equipped with all modern facilities. The marble bathroom has a shower and / or tub. An extra bed is available on request. Wireless Internet connection available with an extra cost. The Superior rooms have all view on the luxuriant garden and are furnished in “Art Nouveau” style, with drapes and flocked wallpaper in warm colors. They are equipped with all modern facilities. The marble bathroom has a shower and / or tub. An extra bed is available on request. Wireless Internet connection available with an extra cost. Winter Getaway: book at least 3 nights and receive 1 night free! Furthermore, € 25,00 bonus valid at bars and restaurants of the hotel.